COLORADO SPRINGS, Colo. — They'll be crammed into a space the size of an RV for more than a year, breathing recycled air, subsisting on dehydrated food and drinking their purified urine. If they die, they'll be freeze-dried in a body bag. And if they survive, they'll have to re-enter Earth's atmosphere at a screaming 8.8 miles (14.2 kilometers) per second. 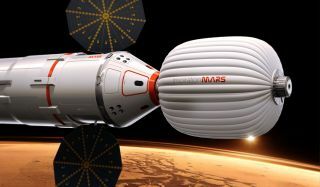 But the applications are already rolling in for the first manned mission to Mars, the project team said Thursday (April 11). Speaking at the National Space Symposium here, members of the Inspiration Mars Foundation described the challenges inherent in launching two humans on a 501-day flyby journey to the Red Planet and back in January 2018, but remained optimistic that those challenges aren't insurmountable. Millionaire Dennis Tito, who became the first space tourist in 2001, unveiled Inspiration Mars' "Mission for America" in February. The goal is to send two people (a man and a woman, possibly a married couple) on a 501-day there-and-back flyby around Mars in January 2018. The positions of Earth and Mars are then ideal for such a quick trip; the next such opportunity won't come around until 2031. The date also coincides with an 11-year solar minimum, meaning the Inspiration Mars crew will be exposed to less solar radiation than during other launch windows, officials said. Tito plans to fund the Inspiration Mars Foundation for the first two years with his own money, with private donations covering the rest of the mission's costs. The goal of the mission is to inspire the public — and Congress — to recommit to long-distance space travel, Tito said at the National Space Symposium. To prove that humans can explore deep space, Tito and his team are planning a stripped-down, austere mission: The spacecraft will pass within 100 miles (161 km) of Mars' surface, but won't enter orbit or touchdown, because that would require additional propulsion systems. "It's like a boomerang," Tito said. "You throw it out there and it comes right back in 501 days." As part of the keep-it-simple philosophy, the crew won't go on any spacewalks during the mission, and opportunities for science experiments to fly onboard will be limited. But the whole mission will be its own experiment, said Jonathan Clark, Inspiration Mars' chief medical officer and a former space shuttle crew surgeon. The crew members will likely collect biological samples from their own bodies for analysis so that researchers can learn more about the effects of long-term space travel, particularly cosmic radiation exposure. To deal with the threat of radiation, the team is working on ways to shield the spacecraft, monitor space weather and even develop antioxidant-rich diets that will help combat some of the effects of radiation exposure, Clark said. The crew members will be middle-aged to prevent any concerns about reproductive system effects. The crew will also be pioneers of personalized medicine, Clark said. The researchers plan to study the individuals' proteins and genomes in order to deliver the best medical care possible with limited supplies, he said. Should a crew member die, he added, there will be a body bag on board that can be vacuum-sealed, essentially freeze-drying the corpse for return to Earth. Keeping the crew members alive will be a major challenge, said Taber MacCallum, Inspiration Mars' chief technology officer. The two Mars voyagers will have to be mechanically inclined in order to fix problems that arise during the mission. Everything will be fixable from the inside, MacCallum said, eliminating the need for spacewalks. Urine will be distilled and filtered to create new drinking water every two days or so, and oxygen will be derived onboard from water and carbon dioxide exhaled by the crew. "All the work to date has shown that this is possible — just barely," MacCallum said. Psychologically, the couple will be picked to be as stable as possible, Poynter said. There is precedent for such long-term isolation, she said, including Biosphere 2, a University of Arizona research facility where she and MacCallum spent two years along with four other people in the 1990s. Issues can arise, Poynter said, including depression, mood swings and "flashbacks almost like hallucinations." But picking the right pair can make all the difference. "You really can select people that will do well in this type of environment," she said. In fact, applications are already pouring in, the team said, despite the fact that the official application process won't begin until next year. "We've already had a ton of applications," Poynter said. "Some of them are kind of interesting, but please don't send your applications just yet. We're not announcing that we're taking applications!" Follow Stephanie Pappas on Twitterand Google+. Follow us @Spacedotcom, Facebook or Google+. Originally published on SPACE.com.